, Johny Walker the best supporting actor, Salil Choudhury the best music director, Bimal Roy the best director. The film also received the national award for best film in 1958. Chalti Ka Naam Gaari was the second biggest hit of the year. Very significantly all the 3 brothers Ashok Kumar, Anup Kumar and Kishore Kumar acted in the film. It was directed by Satyen Bose. In the film the brothers owned a garage. Ashok Kumar fell in love with Veena, but could not marry her. From that time he hated women. His brother Kishore Kumar fell in love with Madhubala. KN Singh played the role of villain in the film. The music of SD Burman became super hit with songs like “haal kaisa hai janabka”, sung by Kishore Kumar and Madhubala. Yahudi was the third biggest hit film of 1958. Dilip Kumar played the character of a yahudi, or jew in the film. It was a love story made in the backdrop of Roman Empire. 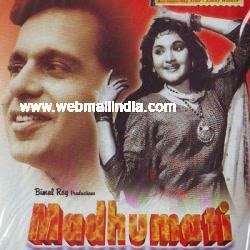 At the end of the film Dilip Kumar became blind. Sohrab Modi, Meena Kumari, Nigar Sultana and Dilip Kumar gave landmark performances. The music of Shankar Jaikishan was outstanding with Mukesh’s hit song “yeh mera diwanapan hai”. Phir Subah Hogi was the fourth biggest hit film of 1958. The film was produced and directed by Ramesh Saigal and starring Raj Kapoor and Mala Sinha in lead roles. The movie was an adaption of Fyodor Dostoevsky's immortal novel, Crime and Punishment. Ram (Raj Kapoor) is a poor law student who supports his education with money orders from his mother and things he pawns. While struggling with his poor finances, he save a boy from accident. Seeing the poor condition of the boy's family he gives all his savings for the boy's treatment. Ram keeps visiting the boy and falls in love with the boy's elder sister Sohni (Mala Sinha). Sohni's father Gopal is addicted to liquor which Harbanslal keeps providing him with. Harbanslal has a mean motive in doing so as he wants marry Sohni. To prevent Sohni's arranged marriage with Harbanslal, Ram decides to rob the pawn broker. But he is caught in the act, and he murders the pawn owner. Ram's conscience keeps telling him to admit his crime. But he never picks up the courage to do so. The police inspector on the case keeps suspecting Ram for the crime. With no proof he, too, is helpless. Ram learns that police have already arrested another thief and have charged him with this robbery and murder. On the last day when the court is to rule in the case, Raj makes up his mind and admits. He pleads saying how he was acting in self-defense against real villains of the society. The court sentences him for three years of imprisonment. Sohni promises that she will wait for his release and then marry him. Raj Kapoor, Rehman and Mala Sinha’s performances were outstanding. The music of Khayyam was very impressive with hit songs of Mukesh, “chin-o-arab hamara”, “wo subah kabhi to ayegi”, “phir na kije meri gustakh nigahon ka gila”, to name a few. Sadhna was the 5th biggest hit film of 1958 with Vaijayantimala and Sunil Dutt in the lead roles. It was produced and directed by BR Chopra. The music was composed by Dutta Naik. Lata’s song “aurat ne janam diya mardon ko”, became super hit. Vaijayantimala received the best actress award for playing a complex role of tawaif in the film. Phagun was the 6th biggest hit film of 1958 with Bharat Bhushan and Madhubala in the lead roles. The film was directed by Bibhuti Mitra. OP Nayyar’s music stormed Bollywood. Rafi’s song “mai soya ankhiyan miche” became super hit. Raj Kapoor’s Parvarish was the 7th biggest hit film of 1958. It was directed by S Banerjee. Dattaram composed the music of the film. Raj Kapoor and Mehmood were born together, but due to accident in the hospital, Nazir Hussain could not identify who was his real son. He was a Thakur. Mala Sinha’s father Harnam Singh gave word to him to marry his daughter with his actual son. Radhakrishan, the uncle trained Raj Kapoor and Mehmood. Raj Kapoor sacrificed his solvent family and deliberately consumed alcohol to show Mehmood was the actual son. At the end the reality was revealed. The music of Dattaram was impressive, with Mukesh’s song “aansoo bhari hai” and Manna Dey’s song “masti bhara yeh sama” became super hit. If the films of 1958 are summarized, it will be seen that while historical films, social films, all created impact on viewers mind. While directors like Bimal Roy, Satyen Bose and others made realistic films, the actors like Dilip Kumar, Raj Kapoor, Bharat Bhushan, made significant contribution. Actresses like Vaijayantimala, Madhubala, Mala Sinha, Meena Kumari created sensation. Music directors like Salil Choudhury, OP Nayyar, SD Burman, Khayyam made significant contribution. Singers like Rafi, Mukesh, Talat, Lata, Geeta Dutt and others were very prominent in the films. The films and the songs should be restored. Guru Dutt, Rafisahab and music in his films. Happy birthday to Raakhee Gulzar.